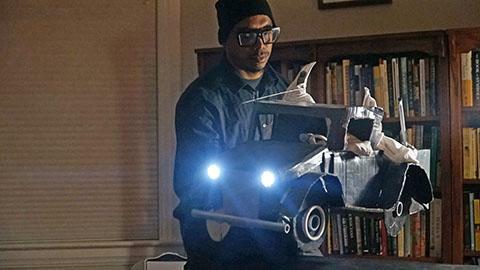 Imagine knocking on the door of a beautiful, architecturally significant Chicago home, being shown into a living room join a small, diverse group of arts loving Chicagoans, and being treated to a delicious meal coupled with a private, intimate performance of cutting-edge contemporary puppetry. Don’t imagine it. Do it! I had the great pleasure of covering the Fall Living Room Tour the year before last. Check out my exclusive video interviews with the puppeteers here, along with live show footage, and a full photo feature. It's good food, fellowship and fun for a great cause. 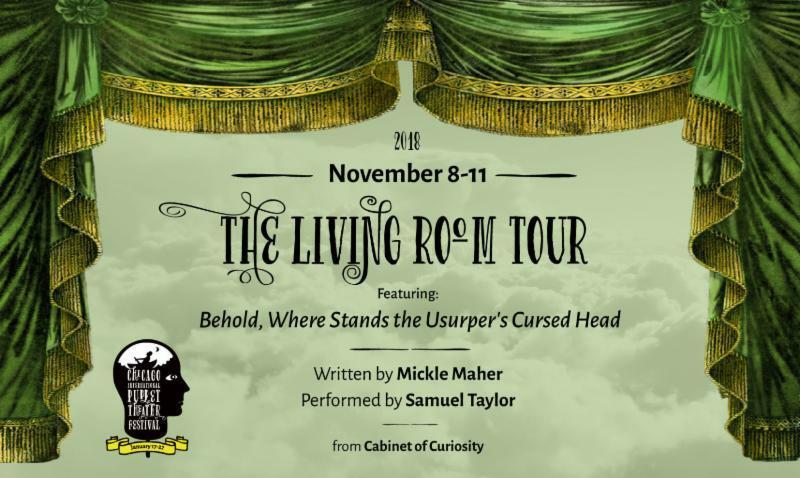 The Chicago International Puppet Theater Festival invites Chicagoans to its Fall Living Room Tour, hosted at four beautiful private Chicago residences around the city, Thursday, November 8 through Sunday, November 11. Each of these special benefit events begins with a lovely meal leading into incredibly intimate, living room performances of contemporary puppet shows including Behold, Where Stands the Usurper’s Cursed Head written by Mickle Maher, directed by Vanessa Stalling and Frank Maugeri, featuring acclaimed Chicago puppeteer Samuel Taylor, from Cabinet of Curiosity. Tarish “Jeghetto” Pipkins performing an excerpt of Just Another Lynching at the 2018 April Living Room Tour. Following are details about the three 2018 Living Room Tour evening events to be staged in private homes in Hyde Park-Kenwood, Logan Square and Evanston, followed by a Sunday brunch event in a turn of the century mansion in Humboldt Park. Tickets to each event are $125. Purchase tickets online at chicagopuppetfest.org. *Note: Exact addresses will be emailed upon purchase but are not shared publicly otherwise. Proceeds benefit The Chicago International Puppet Theater Festival and its Free Neighborhood Tour to Chicago communities. At the home of Michelle and Chad McClennan: a Queen Anne renovation in Chicago's historic Hyde Park-Kenwood neighborhood. At the home of Molly Morter and Jim Jacoby: a turn of the century neighborhood church turned dramatic contemporary residence. Saturday, November 10 at 7 p.m.
At the Evanston home of Monica Kass Rogers and Todd Rogers and West Evanston’s leading concert series, The Pig & Weasel. Sunday, November 11 at 11 a.m.
At the home of Erin Sarofsky and Kevin McClintock: A restored turn of the century mansion. 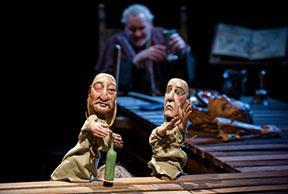 Chicago International Puppet Theater Festival - Blair Thomas Private Shows from The Doc Unit on Vimeo. 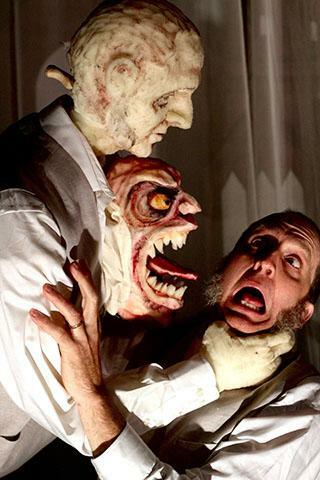 ﻿The Chicago International Puppet Theater Festival was founded to establish Chicago as a prominent center for the art of puppetry, and to cultivate a diverse audience for internationally significant, culturally transformative works of puppetry. In January 2017, the second biennial Chicago Puppet Festival featured 109 performances, workshops, panel discussions and family puppetry activities spanning 11 days at 22 venues across the city. The festival attracted a local, national and international audience of more than 14,000, drawing from 198 Illinois zip codes, 34 U.S. states as well as Hong Kong Australia, Sweden, Poland, Mexico and Canada. Stay tuned for the official announcement about the third Chicago International Puppet Theater Festival, returning January 17-27, 2019. Mark your calendar for a 11-day event bringing the highest quality local, national and international puppet shows to Chicago, showcasing an entertaining and eclectic array of puppet styles from around the globe. Marionettes, shadow puppets, Bunraku puppets, tiny toy puppets, and distinctive, innovative contemporary puppetry will all be on display at dozens of Chicago civic venues large and small. For the latest updates, visit chicagopuppetfest.org, follow the festival on Facebook at facebook.com/ChicagoInternationalPuppetTheaterFestival, on Instagram at instagram.com/chipuppetfest and on Twitter @ChiPuppetFest. The Chicago International Puppet Theater Festival, founded by Artistic Director Blair Thomas, is a mission-driven program of Chicago-based puppet theater company Blair Thomas & Co.